What an amazing spring-like day today was (Sunday 8th February). After the arctic blasts of late it came as a very pleasant surprise this morning so Cockrobbinn and I decided to spend a couple of hours adding to our finds on a series of caches set in Knaphill. 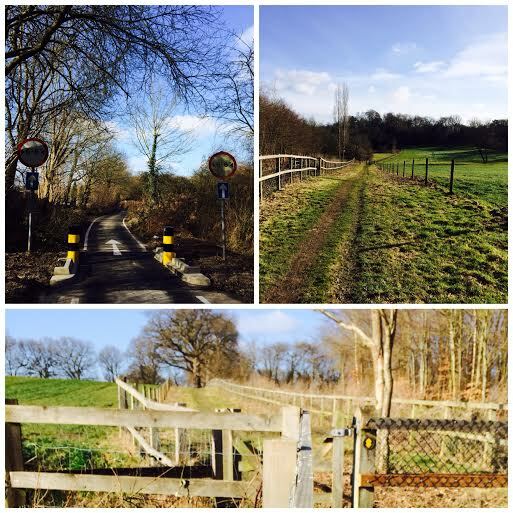 C & S Walk is a mixture of caches set out by a father and son in and around Knaphill, Surrey. Although the original series was about 5.5 miles in length, with all the extras now in place there are about 50 caches to find and what superb caches they are. As we are quite local to this village, we have decided to find these caches in segments and today was our third visit but we are only about half-way through. 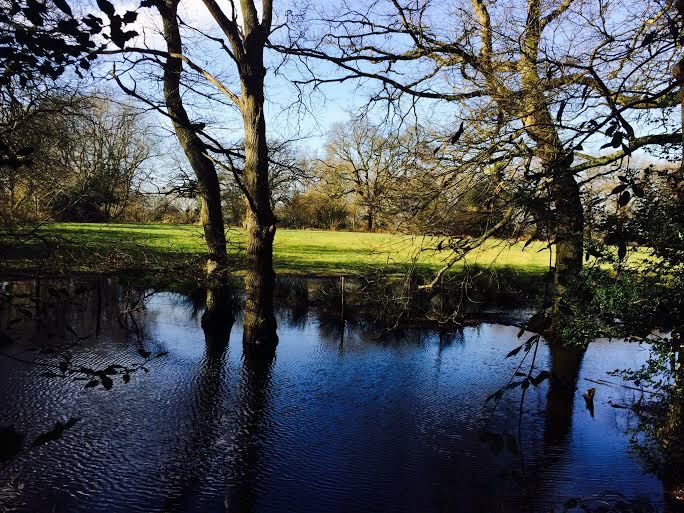 The Priory Clinic stands in beautiful grounds but little did we know that a footpath runs beside it and beyond, and our very first find of the day was out in the beautiful Surrey countryside. Up on the Ridge was, as you can imagine, up quite a high bank with mature trees everywhere; not somewhere you would go unless you were searching for a cache. It wasn’t until we turned around to descend the bank that we saw the cache high up on a pulley. It’s a good thing Cockrobbinn was there as I would never have been able to reach the container whilst holding the cord and I didn’t have my stick with me. On to the next. We were pleasantly surprised to find the footpaths and bridleways extremely dry and easy to navigate then remembered that we haven’t really had much rain here – the odd snow flurry during the past week but very little wet. We were looking for The Dead Half but suddenly found our way barred by a very vocal labrador; the owner not having a lot of control over him and she was some distance away. Having had dogs for most of my life, I know labs are quite friendly but this one had his hackles up and was standing his ground. A determined approach was necessary and thankfully he soon backed down and let us pass. Probably because of all the trees, our GPS sent us down a small side path and we ended up arriving at GZ from the wrong direction which meant we had to battle pesky brambles and holly trees to reach an obvious hiding place in the dead half of a tree. The cache was quite difficult to see though. Our footpath soon came out on a little tiny road; one that I have never seen before and I have lived within a few miles of Knaphill all of my life. 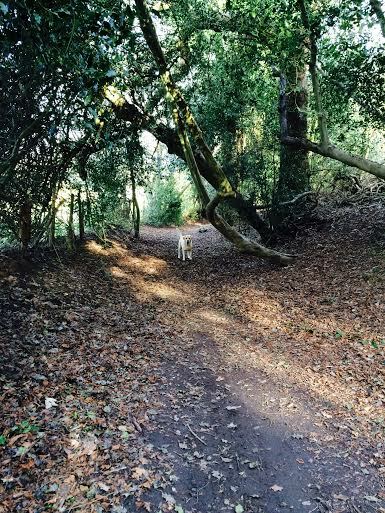 These are the kind of walks I really enjoy – discovering places which we didn’t know existed. After a few hundred yards a left-turn on to another footpath and soon we could see where the next cache might lay. Waiting for a Kiss at the Gate was soon found and log signed whilst we admired the views and quietness yet knowing we were a very short distance from where we had started. Our next two caches were quite difficult to find. The first one Oak’a With Me was obviously something to do with an Oak tree but we were walking along a bridleway edged with huge oaks and our GPS was jumping all over the place. Eventually we narrowed it down to two huge trees; the kind with roots that looked like elephant legs and rabbit holes everywhere. Cockrobbinn found nothing on his tree so we both circled the gargantuan trunk which we thought might have the cache, peeking and poking in every crevice until we came to a very dark, deep hole in one lower limb of the tree. The problem was, who was going to put their hand in there to feel for a box? We couldn’t see anything from the outside but I nervously reached in (forgotten my gloves hadn’t I !!) absolutely dreading coming up against anything furry with teeth and at last my fingers closed on a little clip-top box containing the log. What a relief as I quickly signed the perfectly dry log and returned it to its comfy resting place. Fantastic place to hide a cache. Now why didn’t I think to use the torch on my iPhone to check out the hole first………hindsight is a very good thing. The second very difficult one to find almost had us giving up and leaving it. Sleepy Hollow was just off the bridleway, over the ditch which was thankfully dry, and somewhere among the huge trees (oaks again) between the pathway and the surrounding countryside. With so many trees along this route we were having trouble getting very near GZ with our signals but we guessed at the approximately area to search. For our non-geocaching readers: Ground Zero is the spot where the cache is hidden and in theory where our GPS or iPhone will display a 0m to cache reading. We spent about half-an-hour searching and were on the point of giving up when Cockrobbinn decided to recheck a tree I had already looked at. 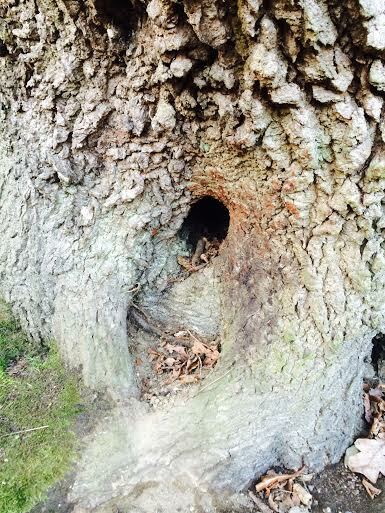 This massive oak had cracks, crevices and gaps galore giving loads of places to hide a cache but I had not thought to look upwards. 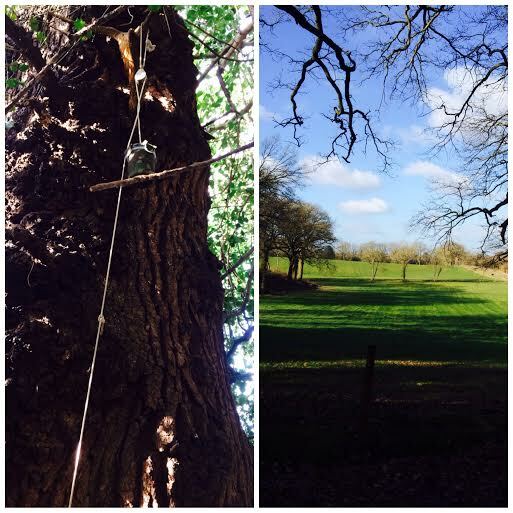 Inside a huge dead limb of the oaktree, high up and almost invisible, was the cache hanging jauntily from a cupboard hook screwed into the wood. It was completely out of sight unless you put your head inside the limb and turned to look right and upwards. 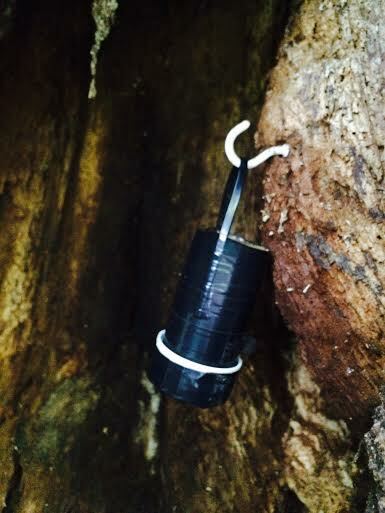 A very, very clever little cache hidey-hole. I really do admire the determination and work Copski and Spaniel2001 have put into hiding these caches on the C&S Walk series. We found another couple of easy caches which took us full circle to where we had parked our car; very close to the local pub which serves an excellent late lunch !! What a nice way to end the search. This time next week, BodRobbinn and I will have travelled a further 4000 miles! Watch this space !!! 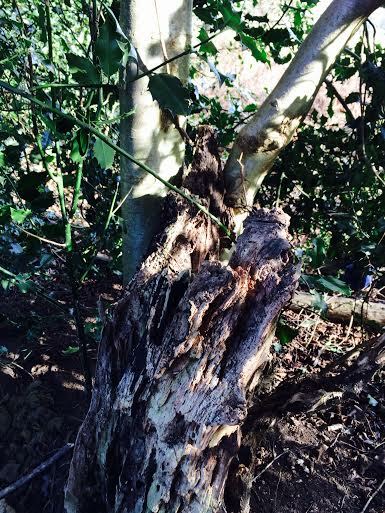 This entry was posted in Cache, Caching, Geocaching, Knaphill and tagged Cache, Geocaching, Knaphill. Bookmark the permalink.